Leaders in the field of photo-electric and laser sensing, Turck Banner have taken this concept a step further by offering laser measurement, from standard to high resolution, in all ranges and at a realistic cost. The comprehensive choice of products means that customers only pay for the performance their application demands and no more. Furthermore, the latest developments and cost savings in laser sensors afford a more reliable solution in many traditional photo-electric applications, giving engineers the choice to upgrade at little or no extra cost. Information outlining the key differences between LED and laser sensors follows a brief overview of the very latest laser measurement devices from Turck Banner. Recently available from Turck Banner is the LM150 laser, delivering best-in-class performance for range, resolution, linearity and speed. The 655nm Class 2 laser delivers reliable performance, superior resistance to ambient light interference and personnel optical safety. Programming and menu navigation is carried out via four push buttons with three bright LEDs providing on-going indication of the sensor status. There is also an optional Remote Sensor Display (RSD) for simplified sensor set up, recipe control and configuration storage. The RSD can be removed after configuration, eliminating the need for an amplifier on each sensor. The LM150 housing is made from high quality stainless steel with a tough acrylic window and is rated to IP67. The device is able to resist mechanical impact, over tightening, extreme vibration and aggressive cleaning procedures, ensuring continuous reliable performance in the toughest conditions. With a range of 50 - 150mm, switched and 4-20mA analogue outputs as well as IO Link communication capability, the LM150 is the ideal problem solver in a wide variety of applications including precision part inspection, product placement, micro-assembly and thickness/height control. Featuring high-speed part detection as fast as 250µs, the Q3X laser contrast sensor can capture up to 2,000 events per second and detect small changes in contrast up to a distance of 300mm. There are also background suppression models available in 50 and 100mm ranges with 60 and 100mm background suppression respectively. These sensors can be programmed for low contrast sensing within this range, while ignoring objects at least 60mm distant. This allows the sensor to accurately detect its target without background objects affecting its performance. This fixed background suppression is vital in overcoming the main problem of standard diffuse-mode sensors, where objects in the background affect the application. A typical application is label detection on a bottle where contrast differences between the label and bottle provide reliable detection but the sensor must ignore a shiny metal rail in the background. Featuring superior, versatile sensing performance, the Q4X reliably detects distance changes as small as 1mm and covers a 25 to 300mm range across multiple target colours, materials and surfaces. With the ability to detect the presence/absence of a target or an object’s orientation, the Q4X solves a variety of sensing applications. The Q4X is ideal for difficult distance-based sensing applications, as it easily detects objects regardless of target surface reflectivity, including black foam on black plastic, black rubber in front of metal, multi-colour packaging and targets of all colours. Analogue versions with 4-20mA and 0-10V output options are also available offering a wide variety of application solutions, including fill-level indication, part positioning, roll diameter and loop control. The Q4X is constructed with robust housings rated to IP67, IP68 or IP69K, allowing use in wet and high-pressure wash-down environments. The LE550 Laser Measurement sensor provides high repeatability and accurate measurement for challenging targets ranging from shiny metal to black rubber. With easy, ready-to-use operation, the LE550 measures 100mm to 1000mm right out of the box—making it an ideal detection solution for diverse measurement applications, including roll diameter, loop control, thickness measurement and positioning. Featuring an intuitive two-line, eight-character display, the LE550 makes adjustments and menu navigation simple and easy to read. The visible red, Class 2 laser beam and small spot size ensure quick setup and alignment. The LE550 is also available with an optional metal, rotatable connector and multiple mounting bracket options, allowing operators to save time and money while accommodating flexible application requirements. For optimal use in demanding environments, the LE550 is enclosed in a tough die-cast zinc housing and includes a polycarbonate lens cover rated to IP67. The products highlighted are a small percentage of one of the most comprehensive ranges of laser sensors on the market today. From the extremely high precision LH series with its 1024 pixel CMOS linear imager to the LTF series, with stable performance in varying temperatures, Turck Banner offers the optimum solution for every application, at just the right price. Why Choose a Laser Based Sensor? 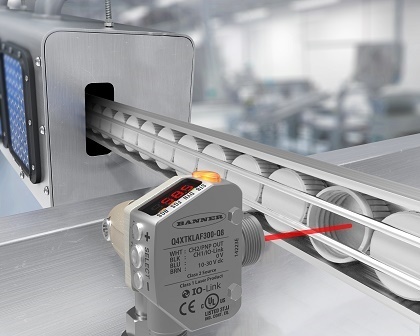 Modern Photoelectric sensors typically employ one of two light technologies, either LED or laser and the choice of light source can be as important for a reliable application as the choice of sensing mode, i.e. opposed, retro-reflective or diffuse. For practical purposes the main differences between laser light and LED light is how it reacts with the outside world. For the ‘techies’ the key property is coherence. Both laser and LED use a diode to generate the light, the laser then bounces this light back and forth within its housing to generate more of the same wavelength of light (monochromatic, single colour), and more critically all the waves are in line with each other (coherent). LEDs also generate near monochromatic light. They have a broader spectrum of wavelengths than lasers but the critical feature is that the light is incoherent, the wavelengths are randomly produced. All natural light and most man-made light is incoherent and has many wavelengths which is why it spreads out from its point source as it travels, whereas laser light remains in a tightly focused beam over great distances. It is this coherence of laser light that gives laser sensors their unique properties of very narrow beams that can travel great distances without spreading out, making them especially suited for certain types of application and a very poor choice for others. In order for an object to be detected, the light from the emitter must reach the receiver or the light from the emitter must be blocked from reaching the receiver. This is true for all optical sensing modes, the object can act to either block the beam or reflect the light to the receiver. Initial set-ups are often fairly simple but maintaining reliability can be difficult, especially if the environment is dirty or vibration is present. The emitted light pattern on an LED based sensor spreads out very much like a simple torch beam, while the receiver has a similar field of view. As long as the beam pattern of the emitter falls on the lens of the receiver, and the field of view of the receiver covers the lens of the emitter, a light beam will be established between the two. With a wide beam pattern and field of view the emitter and receiver can move and rotate a considerable amount without the beam being broken, as often occurs if the units are knocked or through vibration. A laser emitter has a very narrow beam pattern and although this beam can travel a very long way, small amounts of vibration will move the beam off the receiver and break the beam. Laser based sensors are restricted in the amount of light power they can produce, as the risk of blinding someone would make them too dangerous to use in a normal working environment. While conditions are good this low power does not cause any problems, as it remains concentrated in a small area but dirt, oil, snow etc. can disperse, block or divert the beam. This can also be an advantage when detecting clear objects and semi opaque objects. Where an LED beam could pass straight through, the laser beam would be effected. The small spot size of the laser sensor makes it ideal for detecting small objects or small features on an object. It also allows objects to be detected in holes or recesses where reflections from the side walls would make it impossible for LED sensors. The single wavelength of the laser light produces a precise colour allowing the detection of small colour differences that an LED sensor would struggle with. Where laser sensors really excel is in distance sensing. The narrow beam is ideal for triangulation, where the position of the beam reflected from an object will change with the distance that the object is away from the sensor, however the intensity of the beam will remain relatively unchanged with distance. The opposite is true for an LED sensor, intensity changes with distance but the reflected beam is too wide to gain any accurate position information. As the intensity also changes with object colour and reflectivity, attempting to use a standard LED sensor for distance measurement is normally a poor choice. The laser sensor can detect colour or reflectivity with a degree of immunity from distance changes. The ability to detect the object distance allows the sensor to overcome a number of common sensing problems. A background suppression or fixed field sensor will ignore a shiny object that is beyond its cut-off point and still be able to detect a dull object just a few millimetres in front, while a foreground suppression sensor will ignore objects closer than its cut off point. A combination of the two can create a window of detection between its near and far cut-off points. This window of detection is commonly employed together with an analogue output (0-10V or 0/4-20mA) to monitor the position of an object within the window.